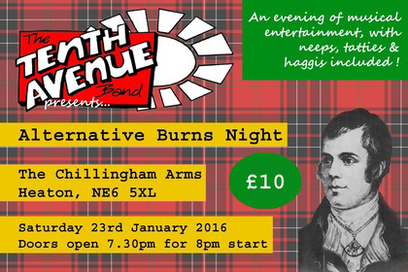 Tenth Avenue Band's 'Alternative Burns Night' is now in its sixth year and is always a sell-out event. As well as entertainment from Tenth Avenue Band we have special guest performances and readings of Burns' poetry and music. ​Food is included in the ticket price of £10 (haggis, neeps and tatties followed by cheese and oatcakes) and The Chillingham also provides a complimentary tot of Scotch Whisky for all our guests. This year's event takes place in the upstairs function room at The Chillingham pub in Heaton on Saturday 23rd January 2016. Doors open at 7.30pm for an 8pm start. Nearest Metro is Chillingham Road, about 3 minutes walk away. If you would like to book tickets for this event, please submit your details using the form below. Tickets will be reserved and held at the door for you, please pay on the night.